Being new to the the makeup world can make you feel like you’re playing catching up. It seems like there are so many things to know when it comes to beauty. From the lingo, abbreviations, techniques and tools, it can seem overwhelming at times. I discovered that understanding the language of makeup can help make things a little easier. Looking at beauty trends on social media and being around people who actually LOVE makeup, made me realize I really don’t know as much as I thought I did. This motivated me to want to find out more about what was happening. I started working within the beauty industry and it dramatically changed my makeup knowledge. It opened my eyes to so many new things like a lipstick with flower in it, unicorn makeup brushes and beauty blenders! Yes I know, I should have known about these things ages ago. But it is easy to fall behind trying to learn the latest makeup trends! I really question how people in real life balance school, work, working out, having a social life and following the latest styles. It seems like a lot but don’t worry. All it takes is a little research and patience and you can learn what your friends are actually talking about. You may have a lot going on but knowing some basic words and trends can really help give you a better understanding. It also allows you to connect with makeup gurus on a whole new level, plus some things you find you might actually add to your own makeup routine! 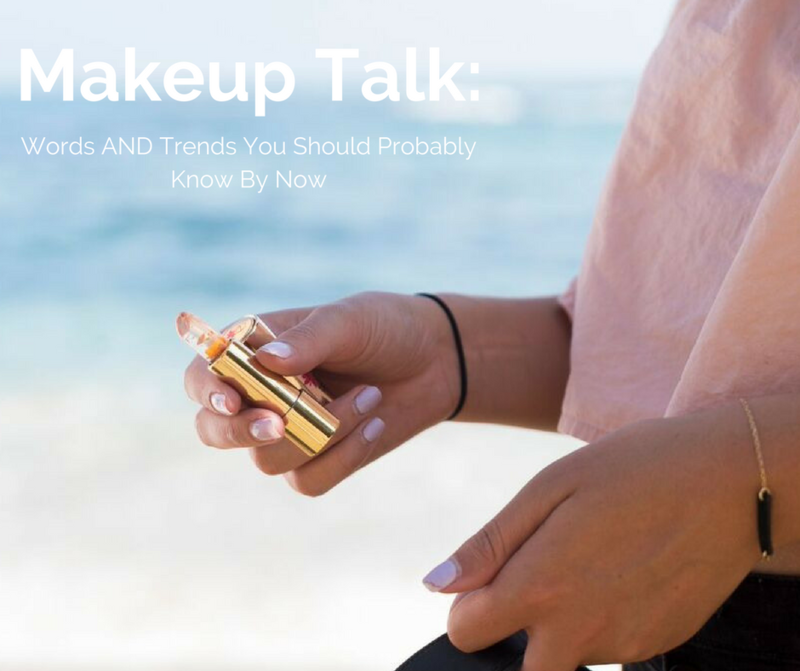 I wanted to share my top makeup slang words and trends (that you should probably know by now) professional written directly from my personal experience of googling them myself. Contouring: Shaping your face to have a more structured, defined face shape. This is done a variety of ways usually with two colors one lighter and one darker. Baking: Leaving an excess amount of powder on your face to set your makeup, once the process is done you wipe off the extra loose powder to have a completed look. Glowing: The term used to refer to your skin or makeup look as bright or radiant, usually done with highlighter/bronzer. Lippie: Another name for lipstick products. Jelly Lipstick: Clear jelly lipstick that changes to your skin temperature. The flower jelly lipstick goes on clear and changes shades as it adjusts. It holds a flower blossom and gold flakes inside and makes a great addition to any makeup bag. Haul: A large buy of products or goods that is usually meant to be shown off. Fleek: This means your makeup looks perfect. Everything about your look is working in all the right ways, work it girl! I know what you’re thinking, clear jelly lipstick with flowers in it? Yes, crazy trends are happening now that you didn’t even know about! Just like fashion, trends come and go. But, with an open mind and a little time, you’ll be leading the next makeup convo with your friends and be on top of the latest trends.